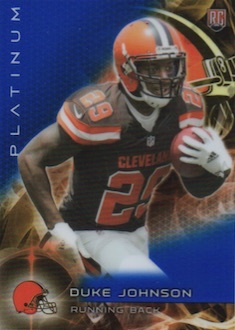 2015 Topps Platinum Football returns as one of those brands that isn't the most expensive on the block, but does its best to offer hits at a reasonable price. While that does mean compromises in a couple of areas, in other areas it takes a more premium approach given the price tag. Hobby boxes of the rookie-focused release come with a pair of autographs as well as an autographed patch card. 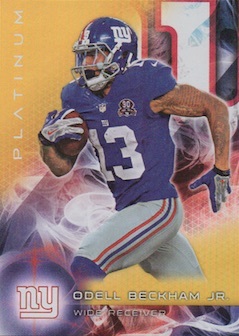 The 2015 Topps Platinum Football base set has 150 cards. The 100 veterans are printed on rainbow foilboard while 50 rookies are done on chromium stock. Gold is the lone parallel for veterans and fall one per pack. The chrome rookies have several parallels, though. X-Fractors fall five per box. Other Refractors include Sapphire, Pulsar, Purple, Black, Red (#/25), BCA Pink (#/10), STS Camo (#/10), Printing Plates and Superfractors (1/1). Rookie Autographs are done as Refractors, and there are also lots of parallels that offer a more colorful shine. Among the numbered Refractor parallels are Sapphire, Blue, Pulsar, Purple (#/25), Black (#/15), BCA Pink (#/10), STS Camo (#/10), Red (#/5), Printing Plates and SuperFractors (1/1). In addition to single-signed cards, there are a limited number of Dual Autographed Rookies (#/25) and Hexagraphs (#/10), which are dual-sided cards with six signatures. The majority of the one-per-box Autographed Patch cards are rookies. Like the basic autographs, these are all done as Refractors. They have more than ten parallels including four different one-of-one Red Refractors that have unique swatches from things like Nike Swooshes, NFL Shields and Gloves. Veteran autographed patch cards are all serial numbered. They don't have nearly the same amount of parallels, but they still have five that are numbered to 25 or less. 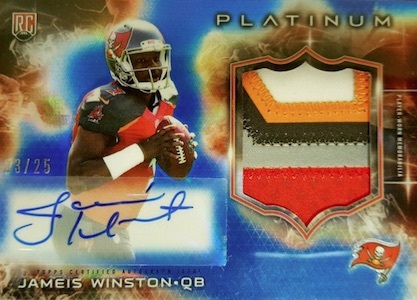 2015 Topps Platinum Football also has a couple of other signed patch rarities. Dual Autographed Dual Patch cards (#/25) have swatches and signatures from a pair of rookies. 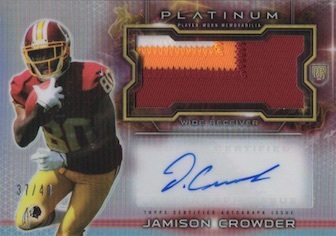 Platinum Rookie Autographed Patch cards are a case hit and have a jumbo patch piece. 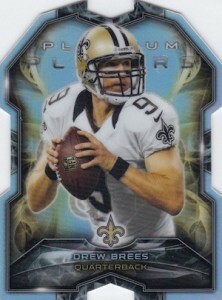 On the basic insert side, Platinum Die-Cut cards are inserted one per hobby box. 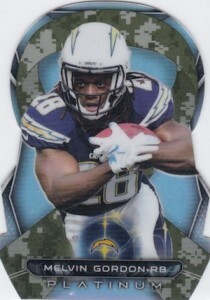 BCA Pink and STS Camo Die-Cut Ribbon cards return for another year as case hits. Both of the Die-Cut inserts have a very limited number of autographed parallels. 2015 AUSTIN HILL TOPPS PLATINUM AUTO ROOKIE CARD #AR-AH NEW YORK JETS RC L@@K! 45 cards. 1 per Hobby case. Good: Three autographs per box, bold design, lots of Chrome Refractors. 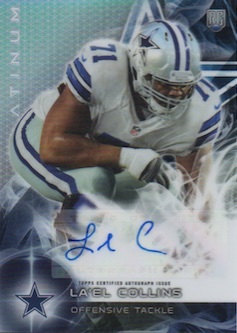 Bad: Shifted considerably to sticker autographs, little else to the release beyond hits and base. The Bottom Line: The overhauled design is certainly hard to miss but the influx of stickers is a painful and unexpected addition. If you like the design, it might be better to hold for the price drop on boxes. Whereas last year maintained a more-recognizable take on a Chrome-ish product, the 2015 design takes things up a notch. Swirls of smoke and a large team logo now occupy the background. I’m not saying it is my absolute favorite, but it is very eye-catching and I feel it gives the product more of a personality. Outside of the that, the fundamentals of the base remain largely the same with several Refractors for the rookies and just the one for the veterans. 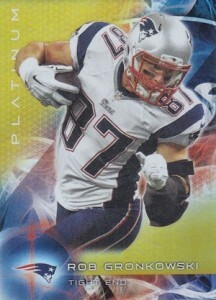 I still don’t quite understand why the Gold parallel for the veterans has a thicker stock. 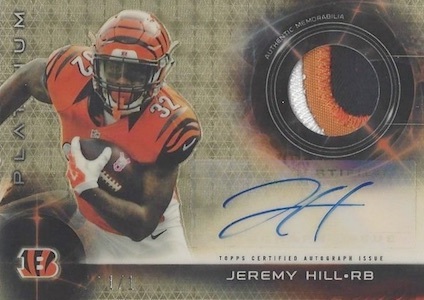 The main issue for most collectors is the sticker autographs that were ramped up in 2015. Largely thought of as an on-card autograph product, stickers appeared in more limited numbers in 2014, but now appear to be the norm in 2015. There are some hard-signed autographs but they are few and far between. Like last year, there is not much else outside of the autographs and base/parallels. The lone insert is the token mini die-cut. Say what you will about Topps, but they always stick to the tried-and-true formula and that can be a little disappointing. I have no major qualms with the checklist. Sure, it would be nice if a mid-season release saw more of a shift to the new rookie names taking the place of the duds or those seeing no playing time. Given the 70-subject checklist, there is a bit of filler in the Rookie Autographs set and that can be a problem as there is a good chance that each box will yield 1-2 of these. While rare, there is also a decent mix of veteran content that covers both younger stars and seasoned vets. 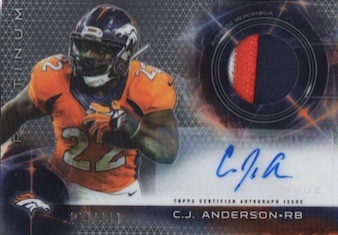 We actually pulled an autographed patch for C.J. Anderson. Not a huge hit these days, but it would have been fairly nice to hit last season. As far as what the product offers, sticker autographs rarely go hand-in-hand with value. However, Platinum has a moderate price tag despite totaling three autographs per box (we actually pulled four) for around $80. 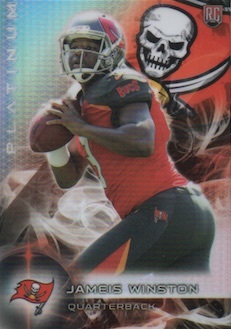 Plus, there is certainly the potential for something big, including on-card autographs or low-numbered parallels. At this price point and three guaranteed autographs, you could certainly do worse. For me, too many products run together these days and I enjoyed Platinum a bit more since it stood out. Brash and shiny, the only thing that holds it back for me is the sticker autographs and limited scope. I would love to see a little more effort in the insert department. Maybe even a few different options per box versus one mini die-cut. One unexpected thing was the fourth hit. Obviously this does not make the product itself better but it is always nice to get something extra. I thought this was to be scheduled to come out this week. Any specific reason for the release date delay? Ty � Nothing I know of other than it was delayed. It usually has to do with getting in the autographs for the product. Still trying to figure out when Willie Snead cards/autos will begin coming out? Any prediction on the print run having him in time for this set? OK Cards I open 6 boxes got a lot of rookies , not close to the base set got 12 cards of the same player x3 maybe a packing error ??? Over all just looks like a cheap card ,BUT the Autographs and Jerseys are nice .I will be sending topps a email about quality of base cards some people still build sets !!! 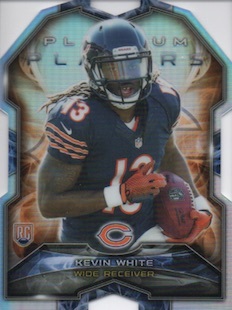 Nice looking cards but not digging the bait and switch with sticker autos. “Featuring on-card autos…” Wow Topps at it again letting collectors down. I am glad they are losing their NFL licensing. Just hope that Panini steps up and puts the collector/consumer, if not first, at least a little higher on the priority list. I’ve picked up 2 3-pack value packs because one of the packs in each was twice as thick as the others. Pulled 2 nice patch autos. Thanks, Topps! Overall design is slipping from year to year. This years is ehhhh, so so I guess. I don’t have access to hobby boxes locally but will always grab a blaster box or 2 of product to see if a I like the product. Pulled 3/5 Amari Cooper auto patch card. Shocker. So disappointed with Platinum this year.. Yes, the throwback designs celebrating the company’s 60th anniversary are cool BUT the current card design is very uninspired. 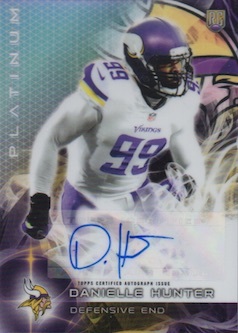 The biggest issue with this product is the move away from hard signed cards. Yes, the low number cards in product are still hard signed but the base auto cards are not numbered and now not even hard signed. Non-numbered autos are already hard on value but now sticker autos too!?! And at the same price point?!? 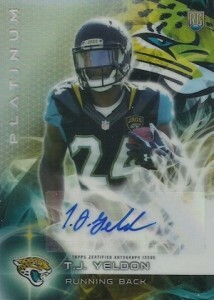 Platinum a great bargain in years past with the 3 hand signed autos per box under $90 but now its way over priced. 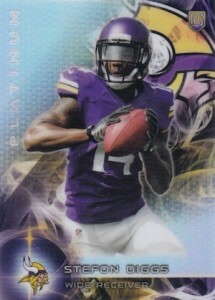 Not much difference from Topps Strata now and at double the price..
Once again Topps you killed another product….. Does anyone know what it means to have a misprinted card? My son got a platinum autograph rookie refractor patch card of Kenny Bell. We’re huge Kenny Bell fans because we’re from Nebraska. However, all the info on the back of the card is wrong! Height, weight, college, and his draft info! Does this mean anything? Thanks for your help! 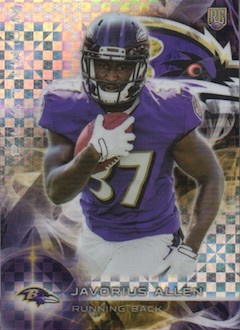 4 stars, lots of little errors…why is my die-cut Marsh’s Lynch(PC-ml) have a Rc stamp?? Too many variations isn’t always a good thing. 2015 Topps Platinum Football Factory Sealed 12 Box HOBBY CASE-36 AUTOGRAPHS !! 2015 Topps Platinum Football Hobby Box - Factory Sealed!